Presentation; This cffect can be presented either aS: part of a mental program or as a straight magic program. If used as a mental.effect, reference should be made to extra-sensory perception cards of Dr. Shine of Duke University, calling attention to the fact.that in those experiments there are only five separate symbols used, while in the one involved here 52 different cards .ire used, and the possibilities of matching these cards over any number of times would amount to astronomical figures. It is suggested that no stand be used, as the audience might suspect some trickery in a stand. The ideal presentation would be from a slightly slanting table so that the audience could at all times see the cards. One way of doing this is to prepare a piece of masonite about 24 x 18, with rough edges covered with felt, and have the back of this board slightly elevated, enough so that the audience can see the cards but still at such an angle that the cards will not slide. The deck held by the magician is genuinely shuffled, stopping at any place suggested by the volunteer assistant, and three cards are placed on the board in such a manner that neither the magician, the assistant, nor the audience sees the face of the cards. The volunteer assistant then selects three cards from his deck and directs thara to be placed on top of the three cards laying on the table. They should be placed so that the top card only partially covers the lower card. 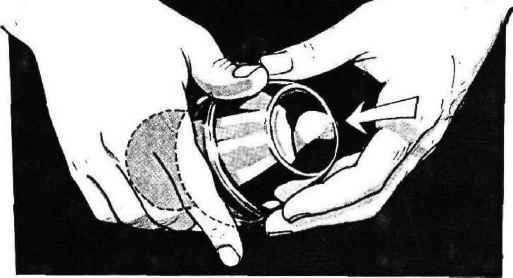 The cards are picked up by the magician, back to the audience, squared up, and when separated the cards are turned face to the audience, and in each instance are shown to be identical cards. How the Effect Works:Two decks of giant cards are supplied for this effect, one with red backs and the other with blue backs. Both decks are treated with roughing fluid, the red deck being roughed on its face. This is the deck that must be given to the volunteer assistant, as it can be handled freely and shuffled in any manner that the volunteer assistant desires. In giving the spectator his "free choice" all that is necessary to do is to ask him his choice between the red and the blue. If he says red, hand him the red deck: if he says blue, state that you will do the effect with the blue dock. The performer then takes the blue deck from its case, shows the faces to be different, and shuffles the deck until such time as the volunteer assistant tells him to stop, and then puts the three face-down cards upon the board. The red deck is then given to the volunteer assistant for shuffling and he likewise selects three cards, absolutely free choice, and hands them one at a time to the performer, who places them on top of the cards already laying on the table. The handling of the blue deck is somewhat different from that of the red as the blue deck is made up at 26 pairs of separated cards. They are roughed in such a manner that if dealt out from one end of the deck (the roughed end) they can be dealt in pairs. So actually when the three cards are dealt on the board, there are three pairs of identical cards, the back of the top card being roughed over its entire surface. When the cards are picked up by the performer, they are squared up and the unroughed portion of the cards is at the top; therefore, when the cards are separated the bottom blue card comes free and the red card is firmly attached to the top blue card. The faces of these two cards are identical, and when turned around will be shown as identical cards to the audience. If desired, the blue card can then be handed to the volunteer assistant so that he will have handled both the red card and the blue card. Word of Caution: Prior to presenting the trick, be sure that the pairs in the blue deck have the roughed portion of the cards all in the same direction. If they are at the top of the case, the deck can be withdrawn and you can immediately shuffle the cards. In laying the cards on the table or board, care must be taken that they do not separate. Also care must be taken when the red card is laid upon the top of the blue card, do that gently, as if the cards are dropped from any distance there is a tendency to separate the two blue-backed cards. With this effect, as in any good magical effect, it is necessary to handle the equipment a number of times before presenting it in public. In reassembling the deck, likewise be sure that the roughed part of the two cards are together and that they ¿re replaced in the deck in the proper manner. You are furnished with 3 envelopes, each with a letter E, S or P printed upon it. You also have 6 cards, 2 of each letter. Cards and envelopes can be passed for examination, as the whole secret is in the routine and presentation. Place 2 cards in each envelope, so that each set of 3 - 2 cards and the envelope - read ESP. You are now ready to perform. "I have 3 envelopes, each lettered differently. In each envelope are two cards. This is a psychological test developed by Dr. Adler while in Vienna at the time he was studying with Freud. The object is two-fold. First, for me to try to judge what you will do in a given test, and second -to see if you believe in ESP. I will take one set of cards - one of each, and I will give you the other set. I will place the envelopes face down in a row on the table. Into each envelope I will place one card, not letting you know into which envelope I placed any of the cards. After I complete this, I will have you do the same thing. Now remember that we have 9 objects, meaning that we have a total of 81 combinations. And note that I place my cards into the envelopes BEFORE you insert yours. 'First, I want to give you a brief test by asking a few questions. What is your age? Are you satisfied with your job? Have you ever had any extra-sensory experiences? (Here you may ask any type of question you desire). Fine, I think I have the information I need, and I will now know how to insert my cards into the envelopes. Now that my part is done, it is your turn. Here I must restrict you somewhat, as I have not yet the skill of .Dr. Adler. I will ask you to select one card only of the Please don't do this at random -■• make a careful choice. Now insert it into any of the envelopes marked with a DIFFERENT letter than the one you chose. 1 hadpossible combinations and this gives you 6 combinations. Thus it brings the total from 81 to 54, which is 9 times 6. I will turn my back, altho\:.gh since I inserted my cards first, it makes no difference. Have you finished? Not? do the same with your remaining 2 cards. Put each into an envelope - other than the one you just used - of a DIFFERENT letter than the card inserted. Now turn the envelopes face down and muss them up a bit. "'Do you believe in ESP? Do you think I could have foretold the order in which you would insert your cards? Look.'" The working follows the patter schema. You will have two results and only two. This is because you placed YOUR, cards each into an envelope of a different letter. The envelopes are letter-side up; you place the cards in them face down. Naturally you do not tell the spectators of this system. When the subject follows your instruction, THE TWO CARDS IN THE ENVELOPE WILL EITHER MATCH, OR THE CARDS WITH ENVELOPE WILL FORM A COMPLETE SET READING ESP. Let the cards slide from envelope, holding the envelope face down. If they match, LEAVE ENVELOPE FACE DOWN AND FORGET ABOUT IT, DIRECTING ATTENTION TO THE MATCHING CARDS. If the cards are different, TURK ENVELOPE FACE UP SHOWING that each envelope contains a complete set of ESP. The simplicity of this trick has nc relation to the tremendous effect upon the audience. It has been tested many times and baffles well-informed magicians and mentalists. It should be presented in a serious way. The principle is quite old and has been used before, but never in this particular form routined by Dr. Pangloss. Martin Gardner, in a copy of IBIDEM, the excellent magical magazine published by Dr. H. Lyons of Canada, wrote up a version using the Aces, Deuces and Treys from a deck of cards. You will find other versions in some of the old books of puzzles. In regards to the patter, the last sentence is important, as it covers either of the two possibilities. If the cards and envelopes turn up in ESP sets, you say. 'Evidently you do believe, as you have by some sort of mental guide put them back into the original sets Naturally, the best climax is when the two cards match. This will happen 50% of the time. Either way it turns out, providing that you have done your part in proper presentation, you will have a miracle. Leave cards and envelopes to be examined, as experience has shown that your audience will wish to inspect them. The desire of every magician is to do effects that are different.. This is one of those effects. It will leave an indelible impression on the minds of any audience. They will remember the effect and the magician who did it for them. A sure-fire reputation builder. Effect: The performer places an examined piece of white paper in a little metal box that resembles a small camera. This is closed and a card is selected. The card is held on the spectator's hand and the camera is placed on the card. The spectator places his other hand on top of everything. You now remove a small flashlight from your pocket and shine it on his hands. The spectator is-now- instructed. Jjo open-the-camera.-- Ins-ide he finds piece of paper -ut lo and behold, there is now on the paper not only a picture of the card he selected but an X-ray of the bones of his hands with the card in between. Apparatus Necessary - A small metal box that looks like a small camera, a supply of X-Ray photo cards with blanks to match, and a double back playing card. Preparation and Presentation: - If you will examine the camera ¿up-plied you'll find that there are three parts to it, the bottom, a metal flap that fits in the bottom and the top that resembles a camera. Figure 1. You will note that the top is magnetic, and will pick up and hold the metal flap. To set the trick up for the routine, place one of the-piiQJta_C3rds '-tithe bottom of the box, photo side down, and drop the metal flap on lo,. You are now ready to perform. Show the duplicate blank piece of paper and drop it in the box. Place the top on and the flap will instantly jump up taking the blank piece of papet with it. This leaves the photo card in the bottom of the'box. Now .force the card that is on;the photo using your favorite method or one of the methods given below. Put this card on the spectator's hand without showing it and put the camera on top of the card. Now have him place his other hand over all. Take a pocket flashlight and shine it on his hands telling him it's a Z-ray. Fig. 2. (At this point we might suggest having a hand buzzer in your pocket and buzzing it at the same time you shine the light). Tell the spectator to open his hands, take the piece of paper out and look at it. There on the paper is a picture of the card and the bones of his hands'. Methods of Forcing a Card: Supplied with this trick you will notice is a double back card. Get the card you intend to force and place it face up on top of the deck, then put the double back card on top of it. Riffle the end of the deck asking a spectator to say stop. Turn this portion of the deck face up where he said stop, over on the rest of the deck. Spread the cards out and have the spectator look at the first back up card. This will be the force card due to the double back card. Figure 4 and 5. Another method is to have the card you intend to force about one third of the way down in the deck and turn another card face up on top of it. The double back card is now placed on top of the deck. To perform, hand the top card (the double back) to a spectator, turn the deck face up and have him insert, the card somewhere near the center of the deck. Then spread the cards out back up and take out the card below the face up card. This is the force card due to the fact that the spectator thinks the card he inserted was a regular card and that it was the face up card. 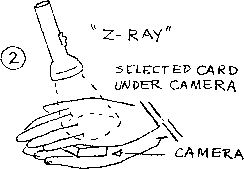 Note: The Z-ray camera caq be used for many other effects as it is in reality a small size card box. You can have writing appear on a blank piece of paper, have one stamp change to another, etc. The card forces mentioned above require a double back card which is supplied in an aviator back design. You can make a double back card to match any deck by pasting two csvrds face to face. THE PROP OF A "THOUSAND AND ONE TRICKS" Sold by Louis Tannen Inc.